One of five clan houses still standing in Georgetown, the Khoo Kongsi clan house takes on a remarkable resemblance to a mini clan village. 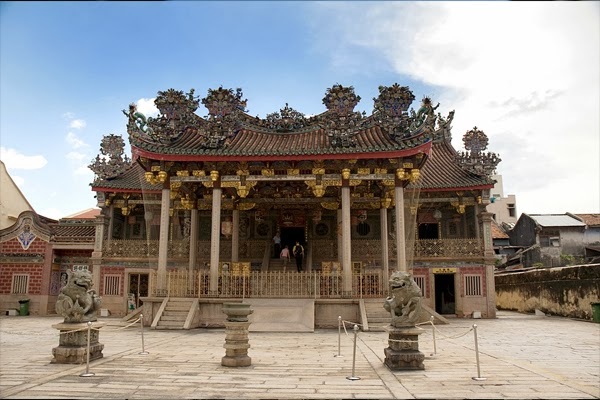 One of the grandest clan houses in Penang, the Khoo Kongsi features tall thin columns supporting a gently sloping, red tiled roof, topped with carvings of dragons, phoenixes, mythical animals and various scenes from popular Chinese legends. The clan house also has a grand hall adorned with resplendent and intricate carvings and richly ornamented pillars which are said to have been crafted by master craftsmen from China. Other major Hokkien clan houses that can be found in Penang are the Cheah Kongsi, Yeah Kongsi, Lim Kongsi and Tan Kongsi. There are two entrances to the Khoo Kongsi. One is on Jalan Masjid Kapitan Kling (Lebuh Pitt), in between Armenian Street and Lebuh Aceh. The second entrance is on Lebuh Pantai, also in between Armenian Street and Lebuh Aceh.